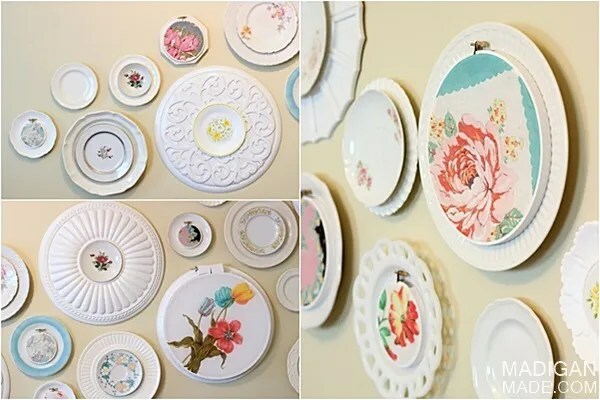 My Gallery Wall: Plates, Hoops & Medallions, Oh My! 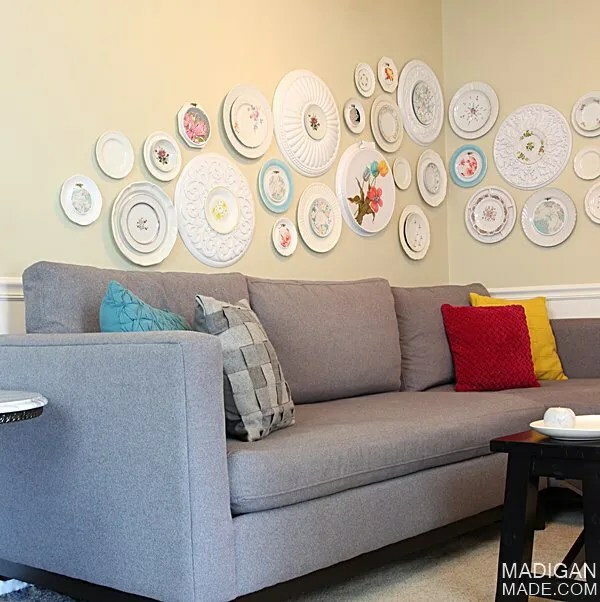 Madigan made… a gallery wall with plates, embroidery hoops and ceiling medallions. 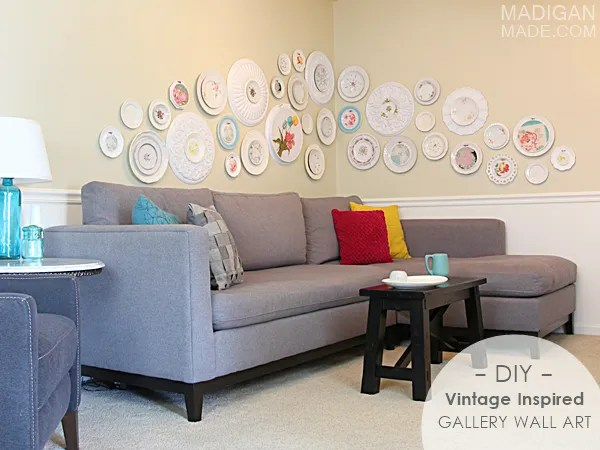 Do you know what happens when a group of ceiling medallions, a vintage plate collection and an embroidery hoop gallery wall collides? 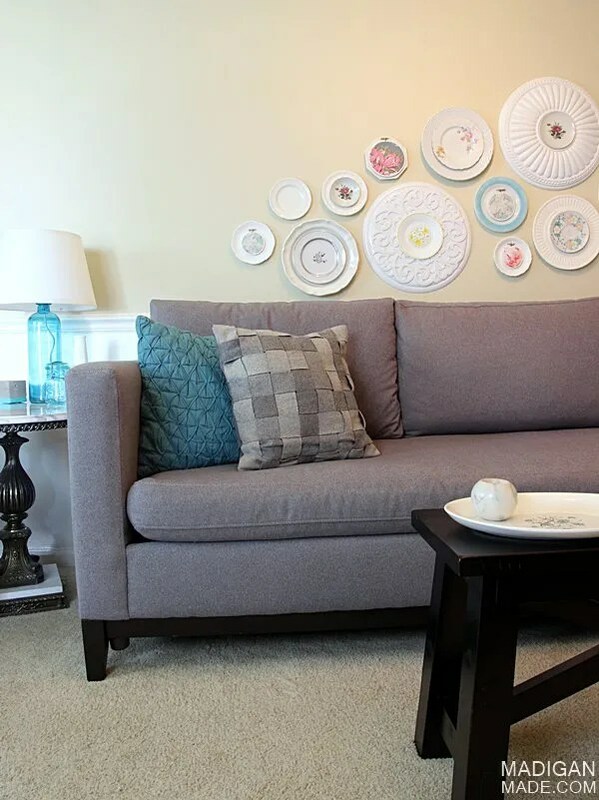 You end up with a unique, fun and personal art display for your family room. My kinda wall décor! Our family room update is slowly… very slowly… coming together. I’ve shown you a few of my projects for this room. Do you remember the sad brown “before”? I’m trying to forget. 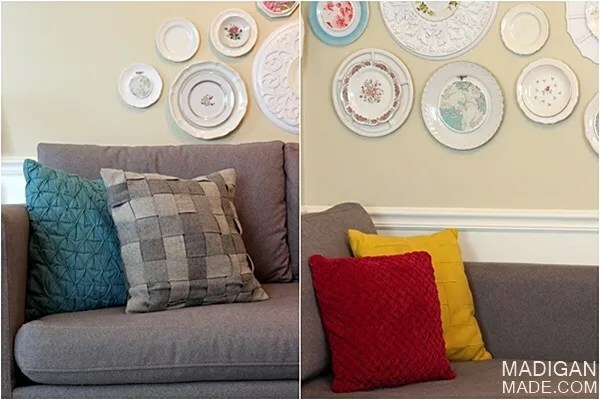 This past year I repainted the room and made some accessories for the space (coasters, books, vases, and other décor) My goal for this room was to keep the wall paint and furniture neutral and bring in color with accessories using a CMYK (cyan-magenta-yellow-black/gray) color scheme. After paint, the next big change we made in the room was to replace the furniture. We bought a large, boxy and modern sectional couch in a dark gray fabric last year to take the place of our old, ugly, orange-brown sofa. We loved the new gray couch but my dilemma was what to put on the wall above it. I wanted to hang something that was NOT modern or boxy looking. For me, the wall needed art of some kind that was a little more traditional/vintage and organic to contrast with the hard, modern lines of the couch. And this art project took over a year for me to complete from start to finish… But it was so worth the wait! At first, I began to collect vintage handkerchiefs in CMYK colors. I thought they’d look neat hanging above the couch, maybe in embroidery hoops or decoupaged onto plates. Then, I started spotting (and buying) pretty vintage floral plates in those same colors at thrift stores. I wasn’t sure if I wanted to use plates or hoops. 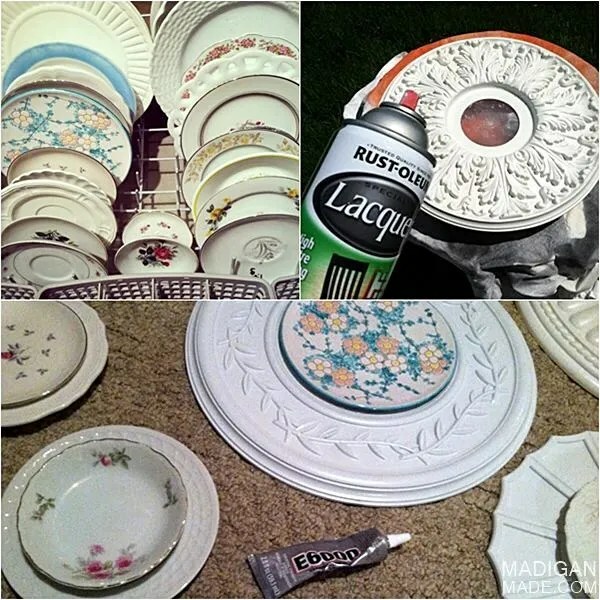 Finally, when I was experimenting and arranging all of these items on the floor one day (to visualize what they may look like on the wall), I offhandedly set one of the plates on top of a ceiling medallion nearby. THAT is when I knew I needed to layer all of these items together. And that is also when my long hunt for more fabric, hankies, plates and medallions kicked off! If you follow me on Instagram or Facebook, I probably showed you a lot of my plate and fabric finds. After many, many months of antique and thrift store searching, I started to assemble and hang my gallery wall. Let me show you how I did that. Warning: If you are someone that is easily upset when someone takes glue or scissors to an old or vintage item… I suggest you turn away now… because I did some major altering to my finds! I cleaned all of my plate finds in the dishwasher first. Then, I used E6000 glue to attach a smaller, decorative plate to a larger, plain white one. First I gave all of the ceiling medallions a coat of glossy white spray paint. (To mimic the look of white ceramics.) Then, I used more E6000 glue and attached a small, decorative plate to the center of each one. I first painted the embroidery hoops white with craft paint. Then I slipped the fabric from the old sheets and handkerchiefs into the hoops, tightened the hoops and trimmed the excess fabric with scissors. 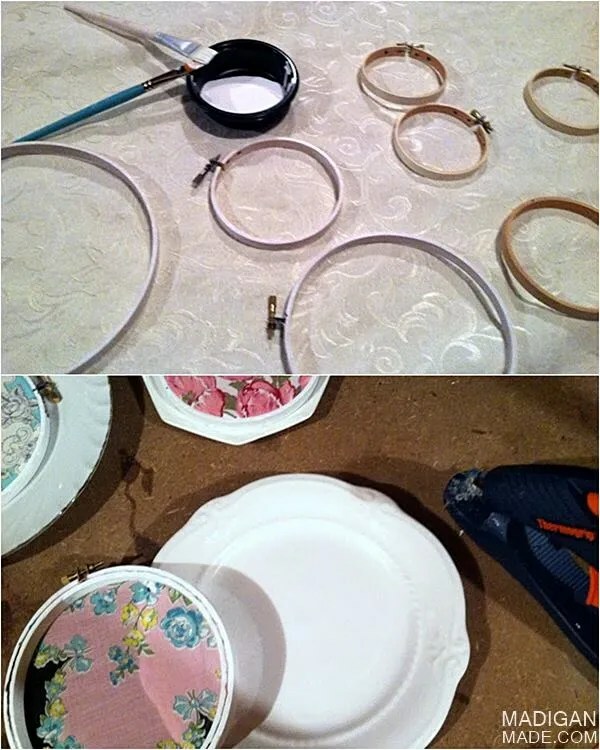 Finally, I glued down the hoops to larger, white plates using dollops of hot glue. I used small nails in the wall to hang all of the ceiling medallions. To hang the plates on the wall I used stick-on picture hanging strips to avoid putting a lot of holes my walls. 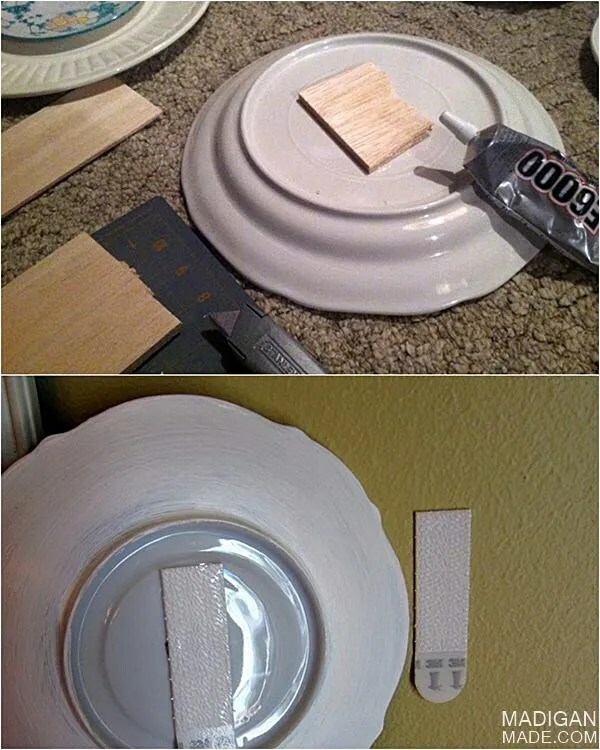 Sometimes… I needed to glue sections of balsa wood to the back of the plates to ‘raise’ the strips up so that the sticky strips were flush with the wall. 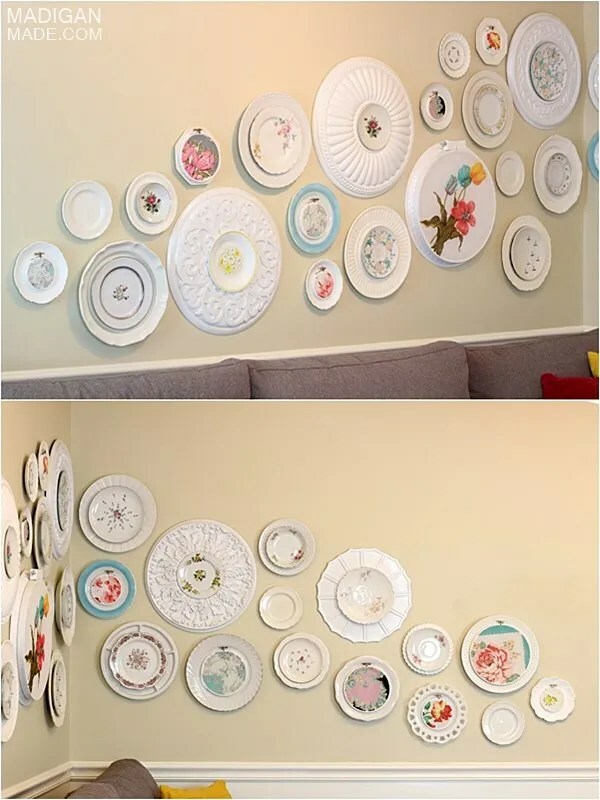 For the smaller, dessert-sized plates I used one medium set of picture hanging strips. But for the larger, heavier, dinner-sized plates, I needed to 2-3 sets of strips on each one. I came up with the idea to hang the pieces randomly by starting from the top corner of the couch and working my way down and out towards the edges. I loosely ‘sketched’ the shape of the pattern I wanted on the wall first by using painter’s tape. Then, I started to hang everything. 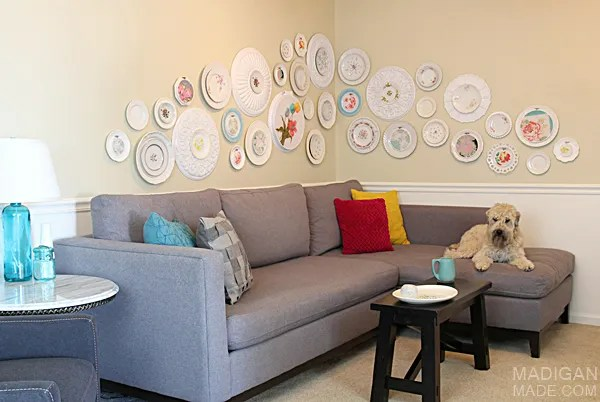 I did my best to keep the pieces close to each other as I worked… I think that helped the plates flow better on the wall and created a more organic look (versus if I spaced everything out evenly). 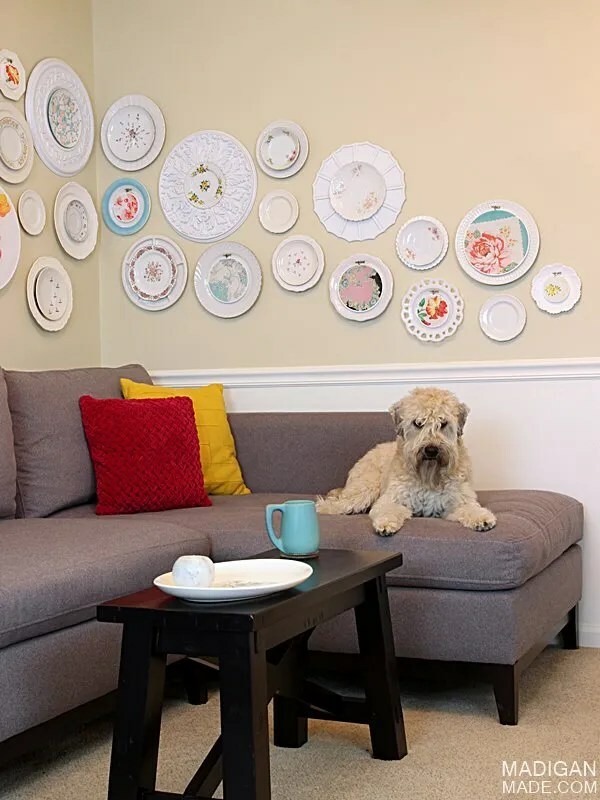 Confession: This plate wall has been up and completed in our family room for about 5 months now… and I’m just showing it to you now. I know! But I waited to share this wall with you for a couple of reasons. First, I ended up rearranging a few of the plates… more than a few times! 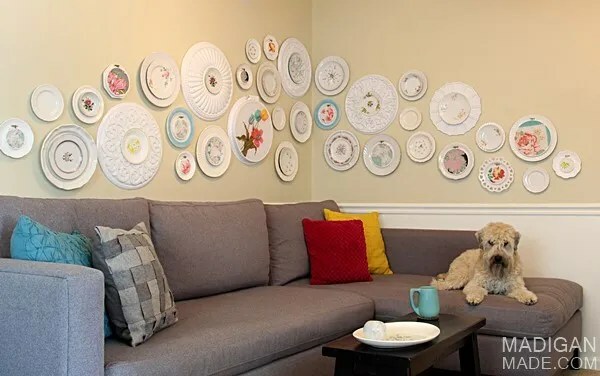 Second, I wanted to ensure that the plates would stay up on the wall using the picture hanging strips before I told you to consider doing it. 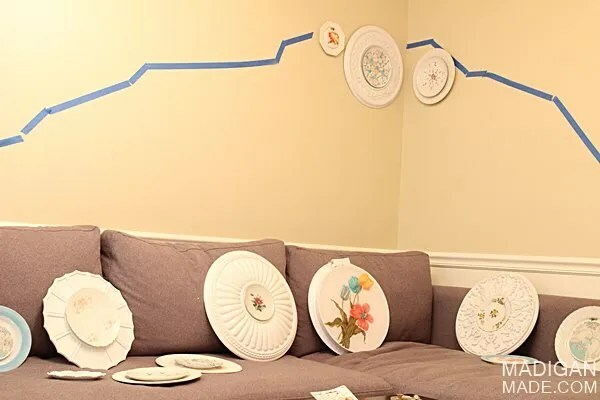 Now, I never had a problem using the strips for plates next to my chalkboard in the kitchen, but those plates were smaller and fewer than this project. So far, I had only one plate fall and that was a large, heavy plate that needed more strips than the other plates. The strips seem to be holding the other plates up fine. BUT I will admit that if someone would bump against a plate, it has the chance to fall. I’ve warned guests that come over to be careful when they sit on the couch for that reason. It took a loooong to to source, arrange and create this wall display… but I am soooo in love with the end result! Sitting in that room – I can’t help but smile when I look at the gallery wall. Every time I examine it, I feel like I see something new. Each decorative plate and piece of fabric is so pretty on it’s own. I can’t decide which piece I like best. I love how the white plate edges and medallions around each of the hoops and plates kinda looks like a glossy frame around each piece. The effect helps each pattern have their own little way to shine amidst all of this vintage goodness. I also like how the rounded shapes and vintage images are a nice contrast to the very modern sofa below. Arranged in this large, bold pattern on the wall, I think that the gallery wall still feels modern in a way, too. Since there was so much going on above the sofa, I kept the pillows on the couch pretty simple. I picked up these textured pillows at Target in blue, pink and yellow solid colors, plus a textured gray pillow, too. A simple oval, vintage platter sits on the bench/coffee table to serve as a tray. Are you curious about the pretty blue glass lamp on the end table next to the couch? Stay tuned in the coming week… I’ll show you how to make your own lamp soon! The family room is starting to come together and I have just a few more things to finish up before I declare this room ‘done’. 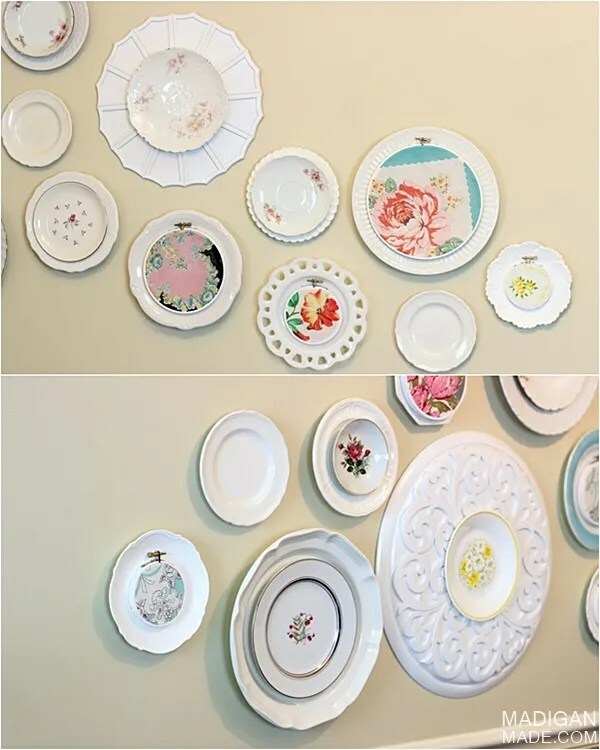 In the meantime… I’m LOVING the mass collision of vintage plates, fabric and ceiling medallions on my wall!